Good point. I'd export them myself if I had the assets. I think there's a couple hangar models floating around but without textures. Besides that I'm not aware of any exports. Teancum wrote: The PSP version's interiors are still pretty small to be honest. 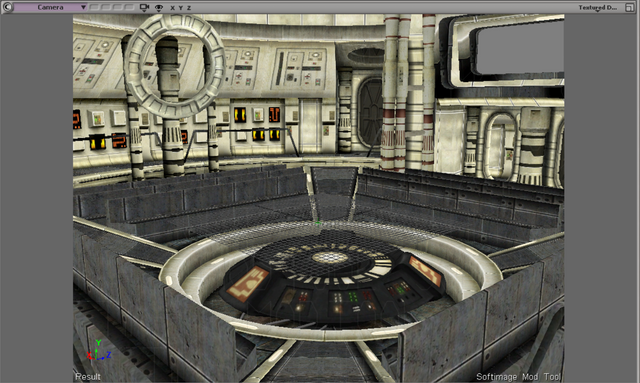 It's much better to have the cancelled SWBF3 ship interiors, which have several halls and whatnot. From what I understand, it is not doable to get the BF3 interiors of the ships. I'd love to be wrong about that but everyone I've talked to with access to the files says it doesn't cooperate with Unwrap3D, etc. So the PSP interiors may be the best shot we've got. Though, if it is possible to get the BF3 interiors, that would be preferable of course. Oh, what is that from? xezene wrote: Sounds good, Teancum! It's the Venator Debriefing room from BF III. I can't remember where I found it. Maybe on facepunch. Very cool. Yeah, after looking into it, I think it was one of the few interior spaceship models released from BFIII. Doesn't seem like there are any on the web for GCW era motherships -- and so along comes Elite Squadron to the rescue on that front. I've moved this discussion out of the PSP Work in Progress topic as it's kind of become its own thing. That said, if anyone has anything to add, that'd be great. Yeah, I'd be glad to hear if there is any news on this front, but I agree with you Calrissian97 that I haven't seen or heard of anything regarding frigate interiors BFIII beyond the material you provided -- at this point, unless someone I am not aware of can export them from BFIII, I think the best bet may indeed be conversion from Elite Squadron, which aren't half bad quality themselves. I ran through the interiors late last night. The textures are incredibly low-rez and are smaller square-meter-wise than the stock SWBF2 interiors. I don't think there's anything to salvage. Alright. Thanks for trying anyway, I really appreciate it.